The Regional Command North (RC North) comprises nine provinces: Badakhshan, Takhar, Kunduz, Baghlan, Balkh, Samangan, Jawzjan, Sar-e Pul and Faryab. RC North borders the Central Asian republics of Tajikistan, Uzbekistan and Turkmenistan. Badakhshan Province shares a border with the Northwest Frontier Province of Pakistan (NWFP) via Topkhana Pass, and a narrow border with China along the Wakhan Corridor and impassable Pamir Ranges. RC North spans an area of 162,151 square kilometers (62,607 sq. miles), slightly smaller than the state of Washington. RC North has a population of 6,751,000 people.1 Tajiks and Turkic ethnic minorities (such as Uzbeks and Turkmens) make up most of the population in the region. Over three million Uzbek and Turkmen live in the north, constituting over 11% of Afghanistan’s population.2 The Pashtun and Hazara population in the north is sparse. The climate in the north is arid or semi-arid.6 The highest mountain ranges in the region – areas such as Tirband-e Turkistan crossing Faryab and Koh-e Khwaja Mohammad in Badakhshan — receive more rainfall. Insufficient water and a lack of irrigation systems limit agricultural development in the north. Major rivers in the north are Kokcha River in Badakhshan and Takhar, the Balkhab River in Jowzjan and Balkh Provinces, and the Amu Darya River which separates Afghanistan from Central Asian republics. Lack of hydroelectric power dams has prevented the use of these waters for electricity generation. Security in RC North is among the best in the country. As the majority of the population in the north is non-Pashtun, the Taliban and al-Qaida have failed to establish a base there. Still, warlords, criminal groups, drug smugglers, and tribal feuds have destabilizing effects in RC North. Uzbek leader General Abdul Rashid Dostum is remains an influential figure in the north. Dostum, whose hometown is in Jawzjan province, is a former pro-Soviet militia commander who later joined the mujahedeen to topple the Soviet government in 1992. He ruled northern Afghanistan under the Taliban until another Uzbek leader, Abdul Malik, Dostum’s rival and current leader of Afghanistan Liberation Party, colluded with the Taliban to depose Dostum in 1997.7 Dostum fled to Turkey, but later returned and joined the Northern Alliance. Agriculture is the primary source of income for people in the north, despite irrigation challenges. Uzbek and Turkmen population are also engaged in small businesses. Carpet-weaving is a major source of income in the north. Poppy eradication efforts have been largely successful in the north. Six out of the nine provinces were opium-free in 2008 and were expected to remain so in 2009.11 Opium cultivation in the provinces of Badakhshan, Baghlan, and Faryab was projected to be eliminated or reduced in 2009.12 However, narco-trafficking from the northern provinces into Central Asian countries remains a major challenge. The 209th Corps of the Afghan National Army is headquartered in Mazar-e-Sharif, under the command of Maj. Gen. Taj Mohammad. 1 United States Agency for International Development (USAID), "Afghanistan's Provinces." 2 United States Central Intelligence Agency, “Afghanistan,” The World Factbook, April 9, 2009. 3 Steve Coll, “Slowly, Slowly Sucked into It,” in Ghost Wars: The Secret History of the CIA, Afghanistan, and Bin Laden, from the Soviet Invasion to September 10, 2001 (Penguin, 2004) 115. 7For details, see Brian Glyn Williams, “Dostum: Afghanistan’s Embattled Warlord,” Jamestown Foundation, April 17, 2008. 8 Brian Glyn Williams, “Dostum: Afghanistan’s Embattled Warlord,” Jamestown Foundation, April 17, 2008. 9David Trilling, “Bridge Connecting Tajikistan and Afghanistan Set to Open,” Euroasia Net, August 21, 2007. 10Paul Watson, “Afghanistan Aims to Revive Pipeline Plans,” Los Angeles Times, May 30, 2002. 11 United Nations Office on Drugs and Crime, "Afghanistan: Opium Winter Rapid Assessment Survey," January, 2009. 12 United Nations Office on Drugs and Crime, "Afghanistan: Opium Winter Rapid Assessment Survey," January, 2009. 13 North Atlantic Treaty Organization, "International Security Assistance Force and Afghan National Army Strength & Laydown," April 3, 2009; North Atlantic Treaty Organization, "ISAF Regional Command Structure," January 14, 2009. 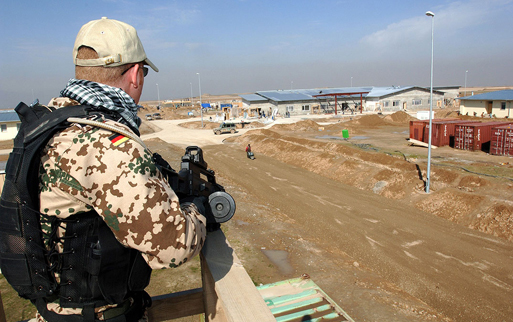 14“German Defense Minister Visits Troops Amid Afghanistan Debate,” Deutsche Welle, March 3, 2009. 15Dave Pugliese, “Afghan Elder Questions PRT in North,” Ottawa Citizens, February 2, 2009.